One of the main reasons I don’t play console or PC games anymore is because I don’t trust myself to not play for hours on end, getting nothing else done. 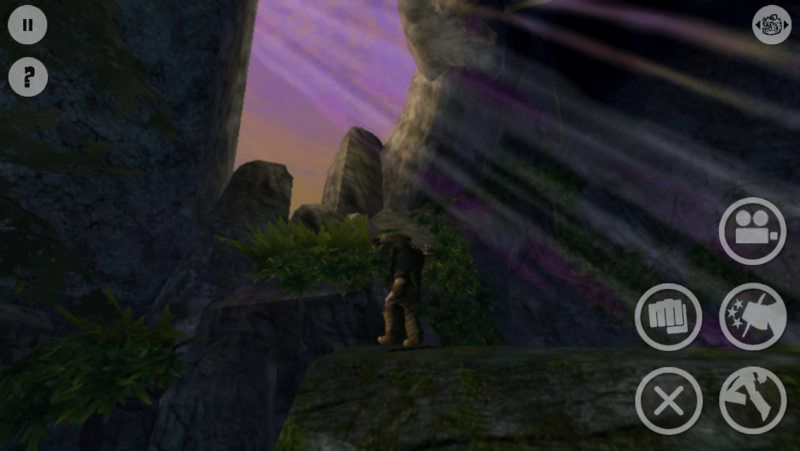 And yet, here I find myself, playing Oddworld: Stranger’s Wrath, a console game ported to iOS. And yes, I’ve been spending way too much time playing it! 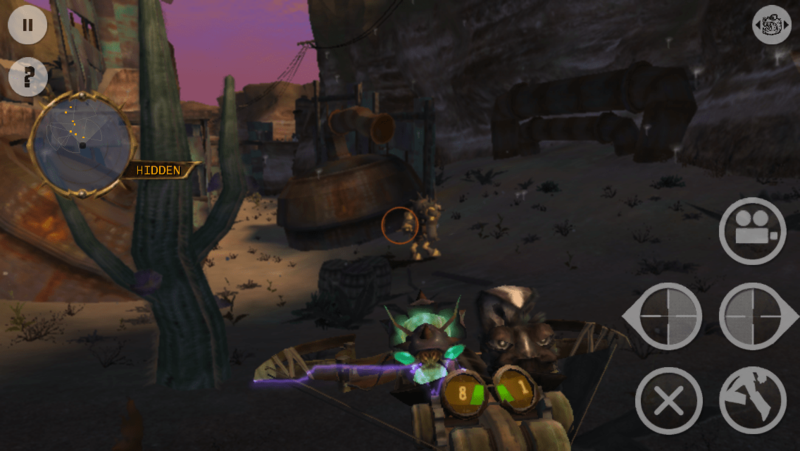 Oddworld: Stranger’s Wrath combines third-person exploration and platforming with first-person shooting (FPS). I’m not much of an FPS fan, but found myself enjoying this game immensely. 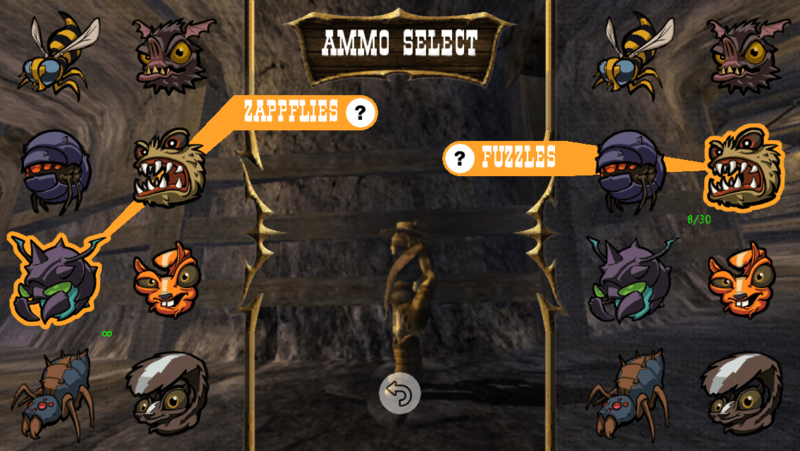 By far the most unique aspect of the game is that your ammo consists of different types of live creatures that each have their own use, and you need to hunt them to refill your bag. There’s something about using critters as ammo that’s just so irresistible, especially when they talk back or giggle. Once you have these critters, you run around a world that resembles the Wild West populated with odd creatures as you hunt bounties. Each bounty is unique and requires a different strategy to take down. You get a bigger reward if you bring them in alive, but it’s much harder to do so than to just kill them. All these aspects add depth to the game and allow a player to take on extra challenge as needed. You play as Stranger (you can also rename him), an outsider with his own story that unfolds as you progress. To move him, you drag your finger around the left side of the screen. The right side of the screen controls the camera, while also housing five on-screen buttons at a time. 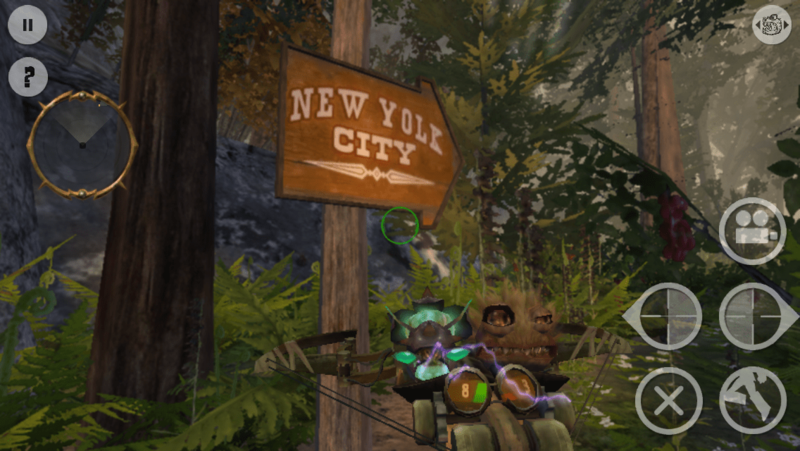 These buttons allow you to swap between first-person and third-person, fire your crossbow, jump, collect bounty, perform a spinning attack and more. You can also use gyroscope, or tilt controls, to move the camera. I’ve been playing on my iPhone 5 and haven’t had any issues with frame rate. 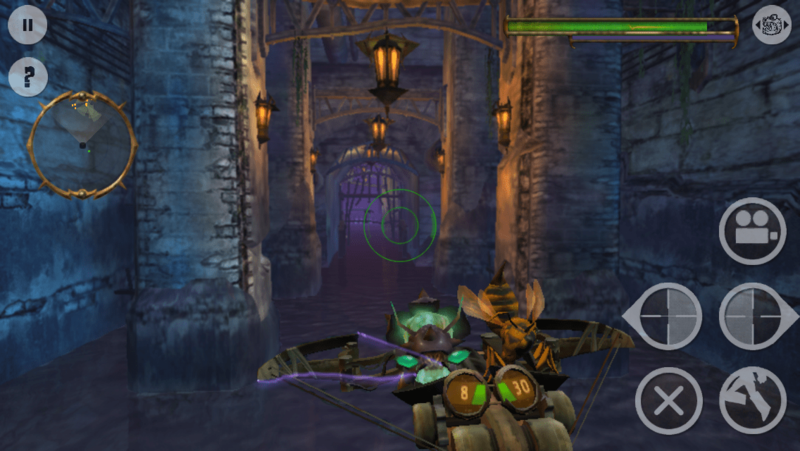 The game runs smoothly, and graphics aren’t Infinity Blade-level, but are very impressive for an open world. The cutscenes are Infinity Blade-level gorgeous and worth watching every second. The voice acting is top-notch and perfectly cast. 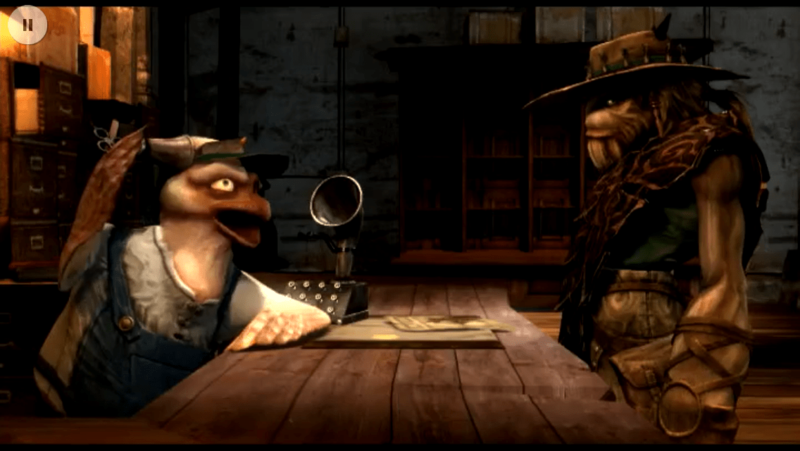 Stranger has a deep, raspy cowboy voice, while the bird-like townsfolk called Clakkers have comical voices. For those who are competitive, there are GameCenter achievements and leaderboards that track how long it takes you to get through each bounty. If you rather take your time and explore, the game rewards you for your curiosity. Charm oozes out of every corner with all sorts of nice touches. For instance, when Stranger bumps into Clakkers, they get annoyed first, then scared if he does it repeatedly. They also get annoyed with him if he asks the same question too many times. There’s even a small village of creatures that do nothing but run around, screaming and hiding. Another nice touch is that when Stranger moves for a certain amount of time in one direction, he will start running on all fours like an animal, and it looks so amazing. I also appreciate the fact that he has the ability to move so quickly. Too many times a game extends its playtime by slowing down the movement. That is definitely not the case here. It also helps if you’re in jam and need to run like the dickens! I haven’t completed the game yet, even on Easy mode, as I’m playing it safe and taking my time. But I have caught the first seven bounties, and I believe I only have four more. They are getting challenging, though, and the controls become a bit of an issue when facing enemies head-on. As it becomes harder to play stealthily, the FPS aspects of the game kick in, and things become more frustrating. I think the game could be a bit more forgiving, due to the inexact nature of the controls versus using a controller. I still hope to complete the game, but if you’re someone who usually has trouble with these types of games, you might want to keep that in mind when purchasing. 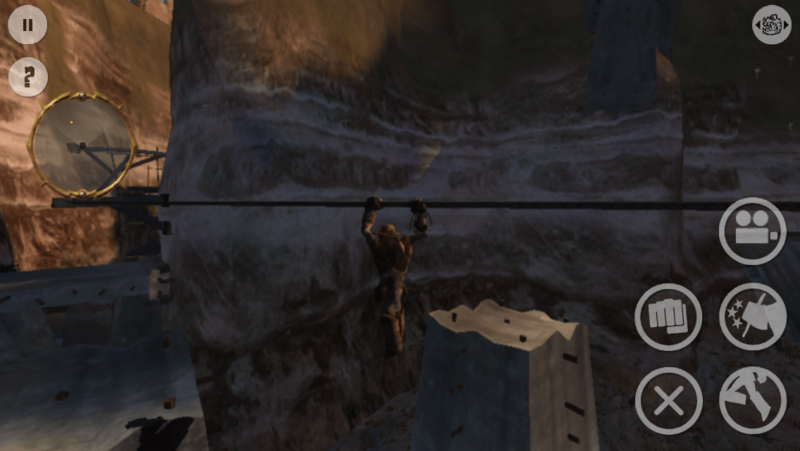 The game can be very challenging, especially if you’re not used to playing FPS games. While there are some control issues and difficulty spikes, the game allows saving at any time, and also auto saves at certain points. This makes it very mobile-friendly, as you rarely lose any progress if you need to take a break. So, if you’re playing on the train to work and are about to miss your stop, just pause and save. The game creates a new save slot each time, so you don’t even have to worry about messing up — you can always load an earlier save, as long as you didn’t manually delete it. But be aware that saving to a lot of different slots makes the size of the app grow. So you may want to go back every once in a while and delete some old saves if you’re tight on space. I’m also really impressed that the developers have built in a way for players to email them their save files if they find any bugs. Next PostSale: God of Light for iOS is currently FREE!